Starts with Scent of a Woman, ends with Groundhog Day. Kind of brings a lompid to your throat. Your singing is like as Sequester the Cat. Forget the song; let’s play sequester the sausage. – What day is today? Endless happiness for a moment. Oh, Wilderness were Paradise now. Or for they who prefer Longfellow. Useless each, without the other. I am afraid I can never be sarcastic about love. A personality failing, I hope never to overcome. EDIT : The Rubiyat; Wilderness enow. A blind man walked by the fish market………….. I think Fleming stole it from “The Party” 1928. Maybe the Koreans, have some Seoul. Shall your love as of old prove true? Young lady marries a very wealth man. After a year, she tells her mother she is going to divorce him. She explains that she can’t stand it any more, because he will only do it by the backdoor. She complained to her mother that when she got married her bumhole was the size of a five cent coin, and now it is the size of a fifty cent coin. Her mother says: “You must be mad. You live in a mansion, you have a holiday home in Southern Spain, you have a GOLD Visa Card, he buys you a new Mercedes every year, or whatever you feel like, he has a Lear Jet, so you can fly over to the holiday house whenever you feel like it. And you are going to give all that up for forty five cents!! After 3 days of bad Japlish translations, I’m just happy we moved on to Korea today! 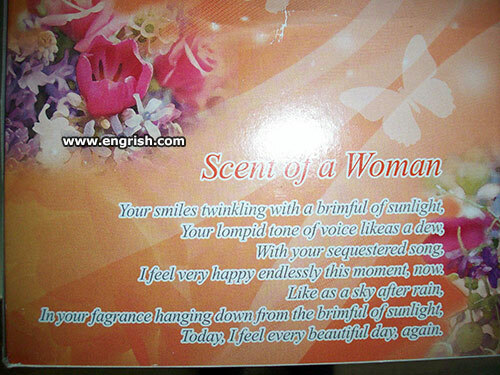 What, no scent of a Man?! My sister’s husband once had a T-shirt which read, “I gave my SEOUL to Korean Air Lines”, and then listed a number of other cities. LOMPID: a new word that works well in acid space rock lyrics. Every time I wiped my mouth with these tissues, I got an erection. Long Tom: Just wait til AI toilet paper becomes affordable….